on the 19th August 2013. This site, as it stands, will be kept alive as point of reference, but will not be updated for the forseeable future. 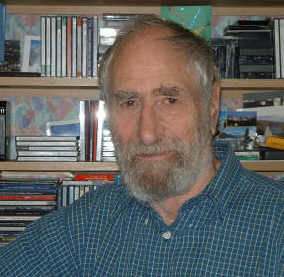 Dr Woolf (a retired medical doctor) has been a life-long music enthusiast who contributed to many music review publications and had edited Seen&Heard until 2001 (earlier postings archived at http://www.SandH/earlier reviews.htm). Musical Pointers embodies the philosophy of SEEN & HEARD, which was previously launched by Dr Woolf, its Editor Emeritus. Musical Pointers brings together also some of Dr Woolf's less ephemeral earlier publications from other websites and paper press publications including The Opera Critic, Classical Net, Early Music Review, Classical London, The Organ and Piano Journal, those including reports of UK and European festivals and competitions, reviews of unusual recordings and composer obituaries in the National Press. DONATIONS There are substantial costs for maintaining an enterprise like Musical Pointers and even the smallest donations will help us to continue as one of the very best mainly "classical" music sites. We have eschewed advertising hoping thereby to retain fuller independence. Please do not hesitate to bring any access and navigation problems to our notice by contacting Musical Pointers. Musical Pointers was launched in 2002 with an avowed emphasis on "niche musics" and we thank our readers and contributors who have helped it to grow steadily during the decade. We hope that our way of Musical Pointing will continue to be what readers want? There have been changes in emphasis, with more reports and reviews of recordings from far afield, and coverage of live events which purposely try not to duplicate too much those to be found in the newpaper and magazine outlets and in larger websites such as Music Web (whose live music section Seen & Heard, which is still active, we had founded in 1999). 2013 sees a significant change in our approach to reviewing CDs, which are tending to become overtaken by new technological advances. LINKS are more and more integral parts of our reviews, increasing information and allowing for shorter texts; many people have not enough time to reading lengthy reviews. In particular, we have been enthused by parallel coverage of artists on You-Tube, where many newer musicians can be seen, often at recording sessions. Good examples, at random, are the links to be found on our reviews of the Nightingale String Quartet, pianist Sebastian Stanley, and recorder player Jill Kemp to give a few particular examples. Inevitably this is time consuming,and comes at the expense of our reviewing fewer of the numerous discs received - until we are joined by some new contributors? We have had some fifty contributors all of whom we thank, but currently, with times hard for performing musicians, the weight of work to keep Musical Pointers afloat is increasingly with your Editor, who has to cope with greatly increased requests for coverage of live events, especially of chamber music far and wide around the Metropolis. There has been a particular increase in the popular lunch time concerts, generally an hour long, which attract large audiences and introduce us to numerous excellent younger musicians with more enterprising repertoire than some of the main promoters and venues are inclined to risk. Reviews of live concerts have become harder to obtain for events promoters, and we have had to limit oursleves mostly to the London area; travel is harder with advancing age. The multiplication of recordings seeking reviews has been expanding exponentially (some 50 discs and recordings are nowadays received from UK and far abroad each month). We have increasingly been favouring DVDs over sound-only recordings where there is a choice, believing that music making is a very visual experience. And please don't overlook our Articles and Festivals sections. There are now some 3,000 reviews and reports on the site, and recently I have began to place new ones next to related reviews of performers and composers, hoping that people will find it interesting to take a look at the other when seeking a particular entry (this does not affect current listings). A prime recent example of that policy is our full page coverage of the remarkable Chinese/American composer Lei Liang. The presssures have caused us to shorten reviews, concentrating upon opinion and avoiding copy/pasting of material generally available, which we compensate wth links to more extensive media reviews in publications we respect. Also, because we guess that far fewer people now look for CDs in record shop shelves, we no longer automatically head our reviews with cover images, preferring to publish more relevant and attractive illustrations when possible; and for live events often including photos taken at the venues where that is not forbidden. New writers are constantly sought and welcomed. And small donations, received occasionally, are always appreciated, as is all feedback. Lastly, if any of our readers are computer wizards willing to advise and help, please do get in touch. We do not have a webmaster and have been nervous of advertising and of the newer Social Media, which I am given to believe might enhance significantly our readership and Google ratings ? Writers who share our aspirations, including those who enjoy indulging in lateral thinking, are invited to make contact and contribute to Musical Pointers.